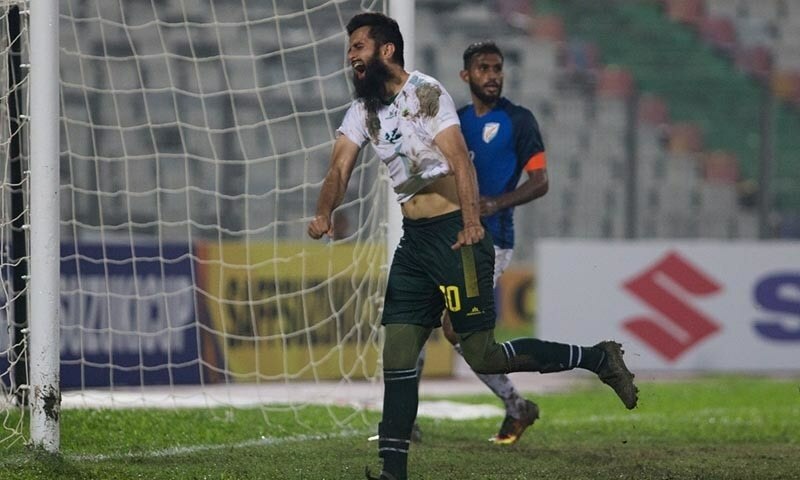 India defeated Pakistan 3-1 in the semi-final of the South Asian Football Federation (SAFF) Championship at the Bangabandhu National Stadium in Dhaka on Wednesday. The defeat ended Pakistan's fairy-tale run in the tournament, where the Men in Green — taking part at an international event after three years — exceeded everyone's expectations. Even in defeat, the Pakistan players gave a good account of their game, holding a far higher-ranked Indian side to a goalless first half before all hell broke loose in the second. Their resistance ended in the 49th minute when India's Ashique Kuruniyan delivered a low ball that was poked home by striker Manvir Singh. Singh got his second of the night in the 69th minute before Sumeet Passi added a third seven minutes from time. Mohsin Ali and Lallianzuala Chhangte were both sent off in the 86th minute before Pakistan found a late consolation. By that time, however, India had effectively sealed the win and booked their berth in the final opposite Maldives. No problems if India played well then the deserve credit. Well played. @Ashton They are indeed more experienced by Pakistani standard. Better facilities, better education and better training. Soon India is going to become the soccer powerhouse in Asia.. The target is to be top 5 in next 5 years and then in top 50 in next 10. Hopefully we can see India play world cup in next 10 years. I wish good talented pakistani players could play in Indian super league. 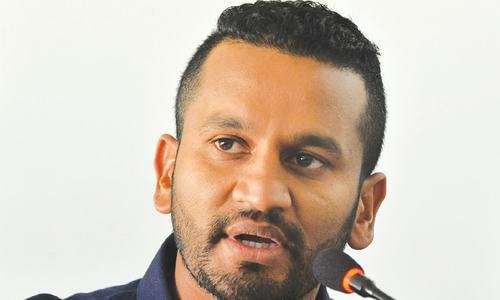 @Naveen Mohan Same question to Indians .... really? Please stop viewing this as a matter of national pride and stop taking away the joy of the game . A one sided game is no fun and a good contest is the best reward for a sports fan . Please increase participation at all levels from club sport and beyond so that sports can flourish in the region and not be held hostage to a political agenda. India for reaching to the Final. Pakistan to reach far beyond expectations ! well played guys, out smart them if you look India ranking compare to ours. It was under-23 team of India. They lacked international experience. Still India gave good result. @Ch.Yasir Azim Outsmart??? India did not play it's "senior" team like Pakistan. It was U23 team that defeated Pakistani senior team. Pakistan should have sent its Street Boys Team that reached the world final. First Hockey than Soccer, India is defeating Pakistan. @Anand Tiwari. Most of the supposed Indian commentators are hung up on their team being U23 rather than revelling in victory. Just goes to show negative mindset. Welldone to Pak team for making it this far and giving us hope. Congratulations to the Indian soccer team. Bangladesh also beat Pakistan 1-0 in 2018 SAFF games at the Bangabandhu National Stadium, Dhaka. There was no fair-tale run for the Pakistan team. In the league stages they lost to Bangladesh who did not even qualify for the knock-out stages. Pakistan team had several players who are playing regularly in foreign clubs. Yet their performance is less than the adequate. @ Farhan Ahmed, Agreed. We need to put more emphasis on football rather than the cricket in South Asia. Had it beet the regular Indian side lead by Sunil Chettri. The goal difference would had been way bigger. Indian Super League is improving football really well for Indian youngsters too. Congrates to indians for bringing politics in sports. I am glad Pakistan still plays football as a sport as can be seen in this comment section. India have sent their U23 team to SAFF championship against National Teams of other nations including Pakistan. So Indian U23 side did pretty well against experienced teams of other nations. But it is good to see that Pakistan National team being in good form and reached to semifinals of SAFF championship after three years. Quite honestly PFF need to introspect in their National Football team which got beaten by U23 team. On a lighter note : First step of improvement is accepting failures. Congrats to Pak Team for making it to the semi's, even though India and other countries have tried their best to marginalize Pakistan and keep it away from sports. Pakistan still did very well regardless of over 3years without playing. Pakistan needs to invest by creating a propper sponsored franchise league's all over the country and telecast it live in HD. That's how people will love the sport and surely it will overtake cricket. Also the Goverment should create football pitchz for locals and football courts in every town and villages for the locals and future talent. Our media such as Dawn should also work harder to promote the sport. Football is a future investment and Pakistan can easily make profit if implemented and organised well. Foot-ball like other games needs power, practice and resources.Many of our schools have no foot-ball team or coach.,Some of the physical education teachers have no training in coaching and playground.OUR physical education area needs competent teachers and curriculum and match experience.With this background we will get the right kind of material and talent for training players for International competition. Results will be different in coming years. We have a sportman as PM. Pakistsn has talented football players they just need the support. ‘Showing his displeasure over the abject performance of various national sports bodies, Prime Minister Imran Khan on Tuesday decided to constitute a task force for the revamping of sports sector in the country.’. Change is coming and with it trophys. Stay tuned. @M. Emad. Overall Pakistan had a better tournament. Especially, after a 3 year absence. It's just a game. And the truth is both teams are way behind in rankings... So both teams need to improve. Congrats to India and well played Pakistan. Our football players hv been sacrificef at the cost of lazy cricket ..a great injustice is being done specially to hockey athletics ..
Cricket has destroyed our all sports . Best of luck Pakistan team. Played well. Want to see more effort from Pakistan side. Congrats India for their win. Pakistan did pretty well to reach last 4 given that playing after long lay-off of 3 years. Our teams needs to play more friendlies and need to have PSL type league to improve our playing standard. Football needs to be given the importance for it in order to grow. Congratulations to the winners and to their challengers.